Flying At the beginning of your upkeep, put a +1/+1 counter on Phantasmal Sphere, then sacrifice Phantasmal Sphere unless you pay 1 for each +1/+1 counter on it. 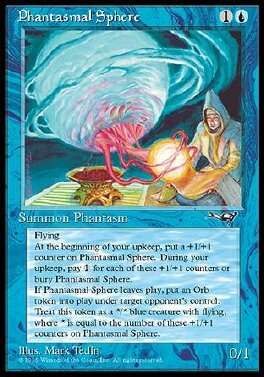 When Phantasmal Sphere leaves play, put a blue Orb creature token with flying into play under an opponent's control. That creature's power and toughness are each equal to the number of +1/+1 counters on Phantasmal Sphere.